CORDOBA, Argentina, Jan 25 2014 (IPS) - Residents of a town in Argentina have won the first victory in their fight against biotech giant Monsanto, but they are still at battle stations, aware that winning the war is still a long way off. 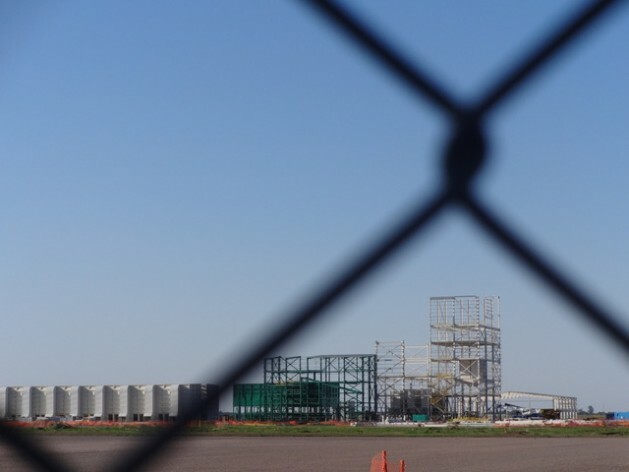 For four months activists in Malvinas Argentinas, a town in the central province of Cordoba, have maintained a blockade of the construction site where the U.S. transnational company is building the world’s biggest maize seed treatment plant. In this previously peaceful town, protestors continue to camp in front of the construction site and to block access to it, even after a provincial court order this month put a halt to the works. The campaign against the plant, led by Asamblea Malvinas Lucha por la Vida (Malvinas Assembly Fighting for Life) and other social organisations, began Sept. 18 in this town 17 kilometres from the capital of Cordoba. Tense situations ensued, with attempts by the provincial police to disperse the demonstrators and provocations by construction union envoys, but a provincial labour court ruling on Jan. 8 upheld the activists’ cause. “The ruling shows that the residents’ arguments are just, because they are claiming basic rights that are recognised and established in the constitution and federal legislation,” Federico Macciocchi, the lawyer representing opponents of the plant, told IPS. The court ruled that the municipal ordinance authorising construction of the plant in this mostly working class town of 15,000 people was unconstitutional. It ordered a halt to construction work and banned the Malvinas Argentinas municipality from authorising the construction until two legal requirements are fulfilled: carrying out an environmental impact assessment and a public hearing. “This is a big step forward in the struggle, achieved by working together on institutional demands, along with social activism on the streets,” Matías Marizza, a member of the Malvinas Assembly, told IPS. “This struggle has resulted in guaranteeing respect for the law,” the activist said. The Malvinas Assembly and other organisations have decided to continue to camp out at the site and block access until the project is abandoned for good. The court ruling arose from a legal appeal lodged by local residents and the Club de Derecho (Cordoba Law Club), presided by Macciocchi. The labour court has ordered an environmental impact study and a public hearing, he emphasised. However, the law does stipulate that if the opinions of the convening authorities differ from the results of the public hearing, “they must justify them and make them public,” he said. Now the Malvinas Assembly also wants a public consultation with a secret ballot. Such a ballot would comply with the environmental law and “guarantee citizens’ full rights to decide on which model of local development and what kind of social and economic activities they want for their daily life, and what environmental risks they are prepared to take,” Víctor Mazzalay, another resident, told IPS. “It is the people who should have that information and decide whether or not to accept the costs and risks involved,” said Mazzalay, a social researcher funded by the National Scientific and Technical Research Council (CONICET) at the University of Cordoba. “An environmental impact assessment should include a public consultation so that citizens can provide the ‘social licence’ necessary for developing any social, economic and productive activity that may affect their environment and health,” he said. Monsanto’s statement said the company does not agree with the court ruling, but respects judicial decisions and will abide by the verdict. The company stated that it had already conducted an environmental assessment, which is currently under review by the provincial Secretary of the Environment. “The ruling arose from a legal appeal, so there is no further recourse in ordinary law,” he said. Monsanto can still appeal to have the decision overturned by the provincial High Court (Tribunal Superior de Justicia, TSJ). The company has already said that it will appeal. “We consider our right to build legitimate since we have complied with all legal requirements and have obtained authorization to build according to the regulations, as confirmed by the ruling of the Court of First Instance of Oct. 7, 2013,” their statement said. “If we consider how long the TSJ takes to process an appeal, by the time there is a decision, the Malvinas municipality and the Environment Secretariat will have complied with the laws they previously violated,” he said. According to the lawyer, the high court takes up to two and a half years for appeals lodged by individuals under sentence, and five to seven years in labour or civil cases. “It would create a real institutional scandal if the TSJ were to deal with this case by leap-frogging all the other cases that have lain dormant in its offices for years,” he said. The Jan. 8 ruling cannot prevent the definitive installation of the plant, which Monsanto plans should become operational during 2014. “But if the citizens’ demonstrations against the plant and the environmental impact assessment are unfavourable to the company, Monsanto will not be able to instal the plant in Malvinas Argentinas,” Macciocchi predicted. The company announced it was planning to build more than 200 maize silos, and to use agrochemical products to treat the seeds. Monsanto is one of the world’s biggest manufacturers of herbicides and genetically modified seeds, and has operated in Argentina since 1956 when it established a plastics factory. “It is frequently argued that there is a reasonable doubt that this productive activity is harmless to human health,” Mazzalay said. “When there is a health risk related to environmental issues, reasonable doubt should bring the precautionary principle into play, that is, an activity should not be developed until it has definitely been proved to be harmless,” he said. awesome! death to Monsanto projects! Tony it’s obvious that you know nothing about the effects of GMO seeds on children’s health, I sincerely hope you do not have to find out the hard way ( if you have children that is ) These people are fighting for their children’s health & future children. So please get educated before ranting on something you know nothing about. Tony, do you want to have the plant besides your house? Why don’t you research what happened in Ituzaingo and many other areas in South America first? GM food is not permitted in many G8 countries – Japan is just one example. Do you have any idea why? Let’s discuss this article taking into account basic information.